I like the way these wedding photos are displayed. They are not in a book somewhere that hardly gets looked at- they are displayed for all to enjoy. I think this little vignette is perfect. oh yeah. good stuff. i could not agree more. It is perfect! One thing I don't like is a display of cheesy pictures. These are very elegant! i love that too. my parents have that in their home and i want to carry on the tradition too! that is nice. i am always a little weirded out by photos everywhere. I do.....too! I love a montage of photos, especially black and white. In the Paul Smith store there is a wall of photos that I love - and letters, ticket stubs and all sorts of letters and items that are just so witty and charming. Love this idea....I never pull out our album! This IS a sweet vignette! We have some of our wedding pics in a gallery wall right now - I love displaying some of them - but we also have an album. It came with our photography package, and to be honest, there are so many different pictures from our wedding that I loved that I couldn't possibly hang them ALL up! This way, I can go back and look at the best ones from the day all in one place. I have it in a nice box with our marriage license - a little keepsake box, if you will! here, here to displaying wedding photos. I never take my book out to look @ my pictures. I have to agree. It looks perfect. I love seeing actual photos of the home owners in a home. they look beautiful classic and chic!! I agree- love it. So unique and special! That's how it should be with wedding pics! Some people don't like family photos in their home decor. But I think they are necessary and wonderful. They give a home some richness. Love the photos!! I totally agree! This is precious! Oooh, I like that too. We got a collage frame for our wedding photos - don't laugh! Seriously, we managed to find one that was NOT cheesy, this one is actually lovely, it's huge, 24x36, and it looks so great, plus we get to enjoy our wedding photos daily! Have a fabulous day, and if you haven't had a chance yet, pop by and check out my Catherine Deneuve giveaway! XO! I'm so glad you posted this! 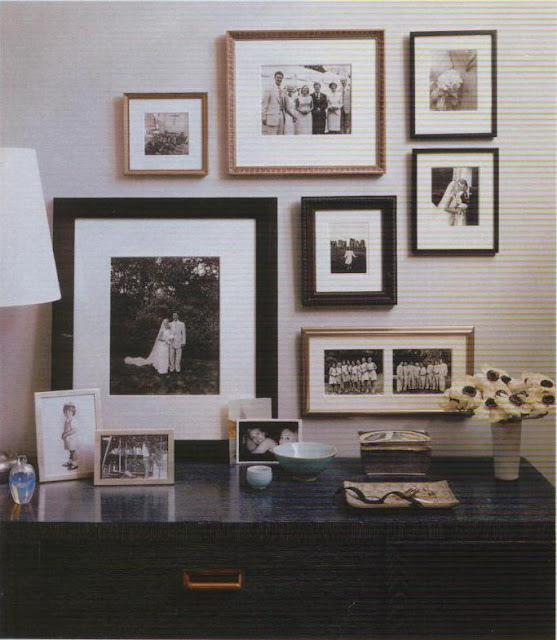 I've been collecting family pictures from both my family and my husband's, and now I have some inspiration for how to hang them! this is very sweet, I put floating shevles in our entreyway and put out some wedding photos...its a nice greeting everyday. I love how the largest frame is resting on the console instead of on the wall.